Students Paddled By Staff After Joining Anti-Gun Walk Out - Are You OK With That? Students Paddled By Staff After Joining Anti-Gun Walk Out – Are You OK With That? A social media post by the mother of a student that was punished for joining the National Walkout Day in support of gun control has gone viral. Here’s what she shared. Clash has reported on the National Walkout Day protests where students ‘walked out’ of classes to protest gun-violence and push for gun control. Often times, these incidents were school-sanctioned activities. Kids were punished for not participating. In one case, a student was reprimanded for holding a sign that read, ‘Guns don’t kill people, people kill people’. A teacher was put on leave for discussing the politics (and the players) behind the walkout and that other protests — like say, one on the millions of deaths resulting from abortion — wouldn’t have been endorsed so enthusiastically by any school administration. 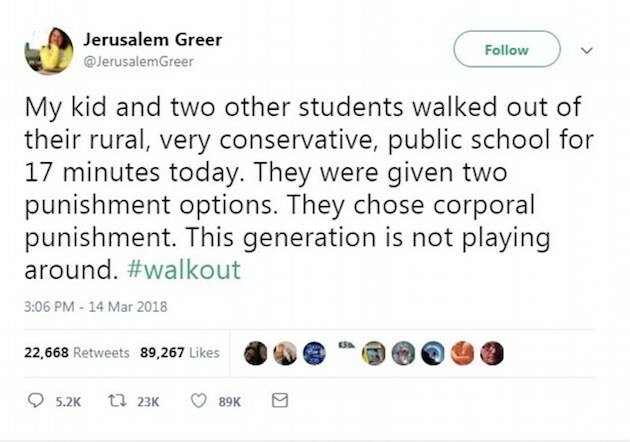 These ‘walkouts’ can go horribly wrong with acts of vandalism and theft, along with flag desecration and anti-cop action by clueless teens that are being used as political pawns. Why should law-abiding gun-owners be lectured by kids that have to be told not to eat Tide Pods? I wish I had an answer to that. Some of these anti-gun kids are obviously completely clueless when it comes to guns, and are just pushing a leftist agenda. David Hogg, the self-appointed ‘leader’ of the protests, has said that people need to use their ‘white privilege’ to discuss gun issues. The more that kid speaks, the worse it gets. He seems to want to stretch out his 15 minutes of fame indefinitely. There have been cases, however, of schools enforcing penalties on students that choose to walk out of class without authorization. This school in Arkansas allowed the students to choose their punishment and they chose corporal punishment. Greer’s son, Wylie, explained what happened to the Daily Beast. Wylie said that he and two other students walked out of the school around 10 am on March 14 to participate in the National Walkout Day organized by the Women’s March Youth Empower. He said that they were mocked by other students at the very conservative school for participating. ‘We sat outside the front of the building and were approached first by the principal, who asked us “if he could help us” and “if we understood that there would be consequences”,’ Wylie said. When the three teens went back to classes less than 20 minutes later, they were told by staff they would be punished by ‘swatting’ with a paddle. Otherwise, they had the choice to get a two-day in-school suspension. All three students chose the corporal punishment. Wylie describes the paddling as ‘a temporary sting on my thighs’ that was ‘not painful or injuring’. The physical punishment was administered to the students only after the parents had given their permission. Yes. Students were given a choice and parents gave their permission. No. Corporal punishment is not ok in school!